Today was very nearly a bad day. I woke early, after a relatively sleepless night, and wondered how the heck I was going to make it through – especially with three tired kids home on school vacation and not a plan penciled into the calendar. (The littlest one has developed an intense fear of spiders and lady bugs, and since our old house is the site of many springtime hatches of the latter, she often simply refuses to go to – or stay – asleep.) The forecast called for sunny skies, but the morning was dull and gray, matching the fogginess inside my head. And then, not long after breakfast, the clouds were suddenly gone, the sky clear and blue. We tumbled out the door around 9 o’clock this morning, and we didn’t come in until 3, and then just for a short breather. Within minutes of exiting the house into the mid-morning sunshine, we had shed our sweatshirts for short sleeves, welcoming the warmth on our winter-white skin. We raked the thatch from the lawn in front of the flower bed, weeded said bed and cleaned out the winter litter, and started turning the dirt in the vegetable garden to prepare it for the seeds we’ll drop there as soon as the sun has adequately warmed the dark earth. I pounded stakes for the pea trellis into the soft ground and returned to the front yard to find the kids in an impromptu t-ball game. That littlest one might be afraid of ladybugs, but not of much else, and she has a wicked swing of the bat. The kids have been begging to eat outside, a request I denied just yesterday when the temperature was chilly enough for hats and mittens. But today it seemed shameful to be in if we could be out, so we lunched al fresco. Partway through our leftover pizza, we heard a familiar bird call that told us the hawk (broad-winged, I think) from last year was back. About an hour later I saw her flit past the still-bare apple trees toward the woods and the nest from last year, built high in an old white birch tree along the woods road. We went for a walk to visit the grandparents around the corner. My son mastered riding his bike sans training wheels, striving to keep up with his twin sister, who has been pedaling free for weeks now. The “big girl bike” for the littlest one arrived at our doorstep, was assembled with only moderate consternation, and now she’s in the biking mix, too. We ate dinner on the porch, with background music provided by the peepers in the pond across the road, then rode bikes around the driveway some more. Yep, today could have been tough. Instead, thankfully, it was beautiful in so many ways. It’s a gamble, during April vacation, to stick around northern New England. It could be snowing. It could be 70 degrees and sunny. It could be 40 and raining. Many of my children’s classmates and their families have fled for the week to safely sunny Florida, or at least as far south as New York City. But today, the gamble paid off. The sun came out. The coffee kicked in. The kids played hard, and they are wiped. I hope they sleep tonight. The frogs are back, and with them the song of spring. Tuesday I drove home at dusk, dodging small amphibians as they leaped across the darkening road. I slowed and rolled the windows of the car down, craning to hear the happy, birdlike sound of the spring peepers and the quack of wood frogs that sing from ponds and vernal pools as winter melts away to spring. Alas, I heard not a peep, despite the hordes of migrating hoppers in the road. But the next afternoon my six-year-old son came running down the driveway from an excursion with his sisters and grandparents to the little pond across the road. “Mama, the peepers are back!” he declared. In a rush he explained all the frogs they’d seen at the pond and how he’d almost caught one. Then he grabbed his scooping net and headed back toward the water. 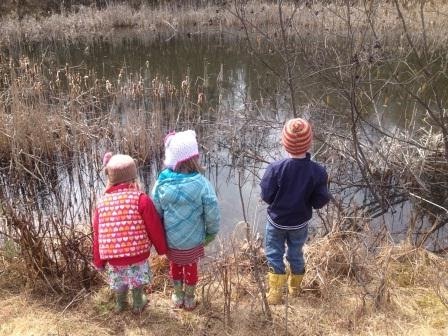 Turns out those were wood frogs, not peepers, but that did nothing to lessen the excitement for any of us. We returned the following day to sit quietly at the edge of the little pond until the raspy quacks of the black-masked frogs sounded back and forth across the water. Last night as the light faded, I stepped onto the porch and listened. At first I heard only the singsong trill of the hermit thrush from the woods at the edge of the yard. And then from a further distance came a peep here, and another one. It’s not the full-blown chorus that will come a week or two from now, but it’s a start. The peepers’ song is one in a string of welcome signs of spring. We spotted our first robin on Easter morning as we headed to the mountain for our last day of skiing. Soon, we were seeing flocks of the red-breasted birds hopping around yards and fields everywhere. The first crocuses bloomed purple and yellow and white among an otherwise brown garden Monday morning as the sun warmed the day, and the daffodils are ready to follow. We’ve heard that the bears are awake and roaming around looking for food. And now the peepers have started their song. The chirping song of one spring peeper sounds like an overly confident spring chick, a hearty “peep” (thus the common name of these frogs). But as the small amphibians, barely larger than a quarter, gather by the hundreds in springtime, their voices merge to create a sound as big as the night sky, like the tinkling of elfin chimes echoing through the forest. The peepers’ warm up – a brief, solitary tune here, a high-pitched chirp there – crescendos into a lively chorus after dusk on the warmest mid-spring evenings, rising and falling, encompassing the gathering darkness. The peepers sing to us through dinner and well into the night, where their song becomes a happy lullaby. The male frogs – peepers, wood frogs, and others – warble for the females, drawing them in with beautiful music. At the height of their mating season, the peepers seem to call from all sides – the pond across the road, the deep drainage ditch in the side field, the swampy marsh around the corner. The frogs begin their spring song as the first flowers open, before the leaves pop to turn the landscape from dull brown to cheerful green. They sing us from the end of winter into the beginning of summer, their music carrying us through late snow showers and chilly rains into the warmth and color and brightness, when the local tarns that swelled in spring evaporate into the heat of summer. By the time the music fades, we are close to the solstice and have become, perhaps, too busy to notice. No longer waiting for the arrival of spring, we’ve moved onto other things – long summer days and dips into cool rivers, cookouts and gardening, hikes through forests dense with rich green foliage. But in these days when spring is taking hold, when frost still whitens the grass some mornings and the trees are mostly bare, we wait each evening for the peepers, listening for their magical music, welcoming this cheerfully tenacious song of spring. For more information about spring peepers, I recommend an article by ecologist Michael J. Caduto, from Northern Woodlands magazine: Spring Peepers, Winter Sleepers. To learn more about wood frogs, I recommend this page from NH Public Television. A friend remarked recently that he’s encountered “frost heaves deep enough to swallow a Hybrid” on local roads. By necessity, I drive a minivan, which is significantly harder to consume than a Prius. 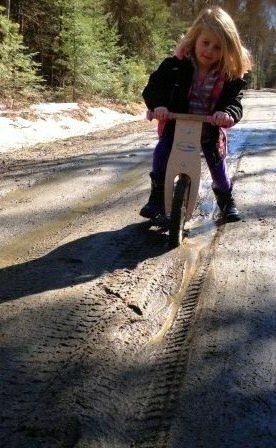 But that’s a great bit of imagery, and I think any of us who travels the roads this time of year can relate to the challenge of steering through the potholes and frost heaves of spring, or, as we so fondly call it, Mud Season. My own road, which turns from rough pavement to narrow dirt one sharp turn before our driveway, is worse this year than I’ve ever seen it. The paved – and I use that term loosely, for there’s more sand and crumbling than pavement at this point – section of the road has decayed to a series of kitchen sink- and bathtub-sized potholes that fill with water and connect to form a virtual minefield for drivers. I’ve accepted that it takes an extra few minutes now to maneuver the half-mile from our house to the state highway at the end of our road. Even that highway is no guaranteed easy travel route. A few weeks back we had to go the long – and bumpy – route home after a sinkhole large enough to swallow a minivan opened up in the middle of the road. The highway crew got in there and patched it up quickly, but there’s now a wide strip of gravel the breadth of the road where there should be pavement. Going down the hill from home is out of the question for me. My husband likes the challenge of steering through slippery, gooey troughs of mud bordered on each side by ditches that are easily deep enough to swallow a hybrid or a minivan. But he drives a pickup these days and has the option of 4-wheel drive. I, on the other hand, chauffeur a gaggle of sometimes-rowdy children in a front-wheel drive minivan. I’m leaving the snow tires on until after mud season; I figure I need all the extra traction I can get. The muddy ruts act like a vortex, sucking cars in so that there’s no exit until the ruts peter out to washboarded gravel. Last year the town road crew, in an effort to make the road passable in mud season, dropped a load of large stones on the two worst sections of the road, which happened to be directly above and just below our driveway. The stones filled in the ruts, alright, but made for an excruciatingly jarring drive. I can’t imagine it was much fun for the guys who dropped them there, either, as they had to dig the stones out to grade the road a month later. The other morning we woke to a fresh layer of spring snow, just enough white to provide a superficial cover on the road and turn that half-mile stretch into a game of memory: zig hard here, zag gently there, watch out for the dip straight ahead. At least on the road to my daughter’s preschool the frost heaves are obvious. Forget hybrids, these monsters look as if they’ve swallowed a VW bus. The swollen pavement lurches to the right, then swoops to the left – right through a pothole, of course. I keep thinking I ought to wash my car, but what would be the point? It would just get covered in mud again the next time I left the driveway. Our house is currently surrounded by a mud moat. The kids don’t seem to mind. They’ve hauled the sandbox toys out of the garage and gone to work digging through the top layer of sand – the bottom is still frozen solid. To get to the sandbox – or the garage – they have to traipse through muddy puddles. To get anywhere, they have to traipse through muddy puddles. And so the house is filled with muddy snow boots, muddy muck boots, muddy snow pants and jackets, and muddy paw prints from the dog. Ah, well. It’s mud season, that time of year where the weather is anything but predictable, and we’re guaranteed our fair share of bumps in the road. Just get out the hose and the broom and make mud pies. After all, black fly and tick season will be here soon enough. Original content by Meghan McCarthy McPhaul, posted on her Blog: Writings from a full life. This essay also appears in the April 5, 2013 edition of the Record Littleton.